Terry Walton made his long delayed visit to Cothi Gardeners for our November meeting. He was certainly worth the wait and gave us a highly entertaining and informative talk. The first part of the talk was about how, after retiring from his career as MD of a precision engineering company, he came to be a media allotmenteer appearing on various radio and television programmes. Currently he is a regular Friday afternoon feature on Radio 2’s Jeremy Vine Show and on Radio Wales. Both shows are live broadcasts; for the former he manages to perform his various tasks, often one handed, while communicating via mobile phone with the studio. He started gardening on an allotment as a child of 4, building up the number of plots he managed to 11 and growing vegetables which he put into veg boxes and then sold to local householders. It being illegal to sell produce from an allotment, he only charged for the box itself and not the veg it contained. By the time he was 17 he was able to buy his first car. He continued to garden his allotment throughout his career, as a hobby. Terry gardens organically. His allotment is about the size of centre court at Wimbledon, water is collected from a nearby mountain stream and he has an unheated greenhouse on site. He uses a 4 crop rotation which reduces pest problems and maintains fertility, has no paths (they waste growing space!) and is self-sufficient for all his vegetables, freezing summer crops for winter consumption. Seeds that require extra warmth for germination are placed in the airing cupboard at home for 48hrs, moved to a windowsill and from there out to the greenhouse. Plant into fibre pots with the bases removed, 2 to a pot. This way they can be planted out without disturbance and the root will not be obstructed and so is less likely to fork. In due course plant out in a drum for long roots, or into the ground under a fleece cloche, thinning to 1 per pot and at a distance of 9” apart. He grows early, mid and late season varieties. They are sown into seed trays, 35/tray, so a total of 105 every year. When approx. 6” high he uses a crowbar to make a hole in the ground into which the leeks are dropped. A piece of 6” long, 3” diameter plastic pipe is then placed over each leek which will allow them to grow long and straight, and increase the length of blanched stem. To germinate, place in a freezer bag half filled with semi moist compost. Once planted out in the ground, water twice a week with a watering can of water with a handful of lime dissolved in it. This helps prevent flower drop. To help reduce mildew early in the season, mix 1 part milk to 1 part water and water or spray over the leaves – mildew likes acid conditions to germinate. Plant out in a shallow trench. To keep continuity and avoid a glut, sow into pots 6 each of Iceberg and Lollo Rosso every 2 weeks, then plant out. Don’t wait until the end of the season to start using them, use from when they are big enough. To combat Cabbage White decimation spray with water in which rhubarb leaves have been soaking for 3 weeks. Repeat after rain. This deters the butterflies. To prevent Cabbage Root Fly place 2 pieces of damp proof membrane, with V shaped cuts, around base of each plant. Sow in February in greenhouse under bubble wrap for an early crop. Sowing into the ground: dribble in compost, then seeds and then cover with more compost for good germination. Alternate with Coleus carina or French Marigolds to help with White fly. Drape bananas over the tomato trusses to help ripening later in the season – the ethylene relased by the banana skins helps ripen the fruit. Use nematodes to help reduce slug populations – repeat every year once the soil warms up. Use a pressure spray to blast aphids off plants then water well to drown them. To grow giant pumpkins feed them 6 pints of beer a day!! I thought we were doing well this year with being ahead of the game in the garden and struggled to think of any topical tips for late November, but Fiona then reminded me we’ve still got to plant our tulip bulbs, still need to cut back the roses, and still need to raise pots off the ground to stop problems with freezing – so there you go, no time to put your feet up just yet. And a few suggestions for a dry day. A highly successful end to the Cothi Gardener’s season. 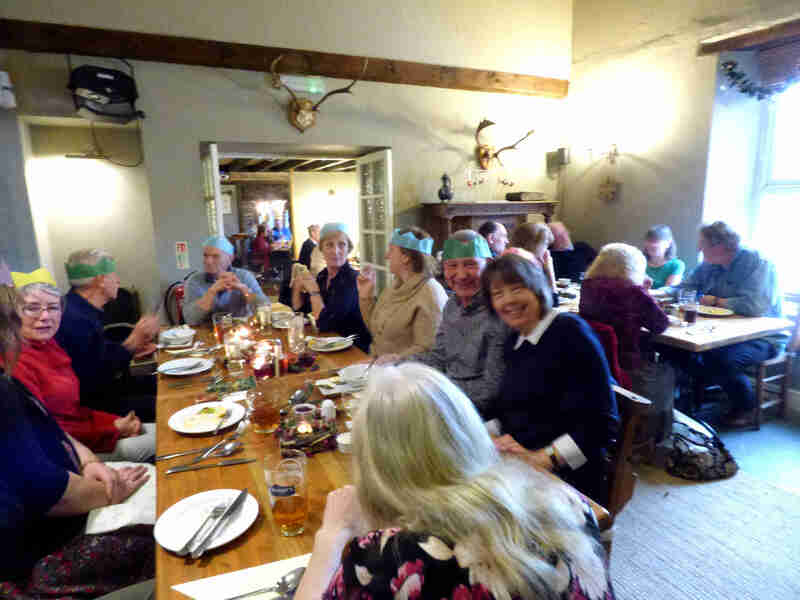 A high turnout of members contributed to a thoroughly enjoyable lunch – excellent food, festive atmosphere and great company. A big thank you to George and Louise and their staff and to all who came to make it such a success. Apologies for the poor quality of the photos but light levels were challenging! Finally remember to put the date for the AGM in your diary: Wednesday, January 16th at 7.30pm. Bring a plate of food to share and be prepared for Derek’s Quiz! For existing members who renew their membership before or at the AGM in January the fee will be £10 (normally £14). In addition, the committee decided that we should introduce a new fee for couples. This would normally be £25 but will be £18 if renewed before or at the AGM in January 2019.